This fall, all the fashion-forward cats are wearing stripes. Ooooh hoo hoo hoooo! MeOW! Did I saw meow? I meant RAWR! Very regal and with a fine fashion sense! She does look surprised however. My guess is that she’s seen a mouse but doesn’t want to risk losing the tiara. What a cutie! I love the pumpkin orange and apple green together. 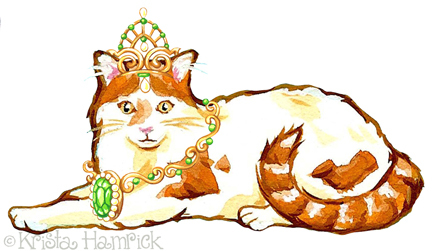 what a gorgeous queen cat! what a fashionable kitty 😉 Love her jewels!